Rhona McAdam is a Canadian poet, almost as well-known in London as in her native British Columbia. 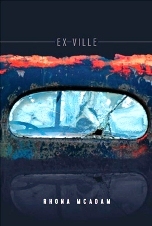 She lived in London for many years and has recently been here again giving readings from her latest collection Ex-Ville. As might be deduced from the title, the book contains poems about looking backwards – to places, to departed family and friends, to relationships and to one’s own former self. at the edges of homecomings. The consequences of such phone calls are movingly addressed in later poems. ‘Scatterling’, the second poem, deals convincingly with remembered links to significant places, substantiating an initial claim (or is it merely a hope?) that I live on in London. out at lunchtime, its errands urgent and forgotten. McAdam has a deft way with line breaks: notice how the seemingly self-contained observation My past keeps slipping shifts its meaning as the next line begins. She has already played a similar trick on us in the previous poem with the line We had no sense. We are codes and numbers and holograms. We may no longer smile. to have them say so. next to the former home of the farmers’ market. Similarly eccentric is ‘The Phantom Bus’ – Now that its existence has been questioned /it no longer comes. A different and darker travelling poem is ‘Furlough’ – a powerful reported speech account of an in-flight meeting with a US soldier on leave from service in the Middle East. He is looking forward to two years time when he’s pretty sure /they can’t call him back again; but he must moderate his hopes because rules /change, he knows, in times of war. This is a convincing voice and a fairly rare example of McAdam stepping outside her own frame of reference (another is ‘The Obituarist’ discussed below). Your silence was with me all week. The trail I always meant to show you. The recovery from loss – or rather the re-making of self – is slow and is spelled out in an elegant pantoum ‘High Tides’: I’ve swum free of my body; I’m buried at sea; / gone is the body you held in those hands. Other fine poems at the heart of the book are prefigured by that late-night phone call in ‘Back When’ and deal with the heartaches of looking after elderly parents as they decline into physical and mental frailty. In ‘Lost’, McAdam skilfully uses experiences her readers may find familiar in order to approximate the confusions of dementia by the feeling of being lost in a strange city or unable to find the right entrance to a re-modelled hospital (we spent twenty minutes / traversing the old parking lot). In ‘Extended Care’, the promotion of image over substance – in healthcare as in so much else – is neatly skewered. The old sort of nursing home was simply the place where mothers go. But now things have changed: They put a capital letter / in Home, and that made all the difference. As can be seen from the quoted extracts, most of the poems are in the first person (singular or plural); but the book contains some well-judged exceptions, such as ‘Furlough’ and a wonderfully eerie poem about ‘The Obituarist’. This seems at first to be oddly out of place – until one realises that to be an obituarist is to make a profession out of looking backwards. This particular practitioner gleans the manner of each death and then paddles his cargo of words / across still waters until at last he drops their secrets in the lake, and the loons / tell them back to him. Elsewhere, McAdam can take inanimate objects like photographs or doors and construct a meditation as eloquent as an overtly (first- or third-) personal expression of emotion. There is of course a risk that a book constructed largely around regretful hindsight may at times prove to be heavy going. But for the most part McAdam manages to avoid building up a cumulative sense of bleakness and shuns the negativity of self-centredness. ‘I Raise a Glass’ sensitively tackles the painful subject of childlessness by giving as much attention to the unborn children as to the feelings of the narrator. And ‘Every Good Boy Deserves Favour’ takes the lesser disappointment of being unable (after many lessons) to master the piano and turns it into rueful admiration for those who could successfully lift the lid /on this box of suffering. The underlying sadness of much of the material is consistently counter-balanced by adroit and often dry observations, like the journey on a Greyhound bus that is a race / against comfort. I suspect that many readers will discover episodes from their own lives being illuminated by McAdam’s carefully crafted imagery and insight. Thomas Ovans has a background as an academic and technical writer but has been a serious reader of poetry for a quarter of a century. Since 2011 he has been a book reviewer for London Grip; and he is now also an occasional poet whose work has been published in both on-line and print magazines.